Todays question which I often get asked is What databases are on that server? This is often a follow up to a question that requires the Find-Database script. It is often asked by support teams investigating issues. It can also be asked by developers checking the impact of other services on their DEV/UAT environments, by change managers investigating impact of changes, by service managers investigating the impact of downtime, when capacity planning for a new service and numerous other situations. This only shows you the name but if you need more information about your databases then have a look and see what you require. If you want aliases for your column headings you will need to add a bit of code to the select. For Example, maybe you want to Database Name as a heading and the Size in Gb (Its in Mb in the example above) You would need to create a hash table with a Label element and an Expression element. The Label is the column heading and the Expression can just be the data or a calculation on data. Write-Error "Could not connect to $ServerName - Server did not respond to ping"
Write-Error "Failed to get database information from $Server"
Write-Output "`n The Databases on $Server and their Size in MB `n"
This entry was posted in PowerShell, Powershell Box of Tricks, SQL Server and tagged automate, Box of Tricks, column alias, databases, Powershell, properties, SQL Server. Bookmark the permalink. Loving the use of rock bands in your example. 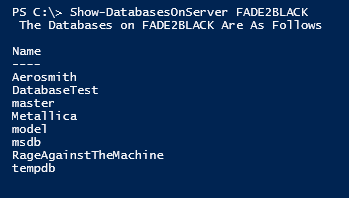 Thanks for the powershell tips.